, a gentleman eminently conversant in literary history, was born Jan. 1, 1742, at Stewart-street, Old Artillery-ground, London, of a family, we are told, “highly respectable, and of considerable antiquity,” but certainly at this time somewhat reduced, as his father was in the humble occupation of a baker. He is said, | however, to have been a man of education and abilities very superior to his condition, and both capable and desirous of bestowing those advantages upon his son, whom he sent to an academy at Streatham. In 1757, Mr. Reed became an articled clerk to Messrs. Perrot and Hodgson, then eminent attornies in London; and at the expiration of his articles, engaged himself as assistant to Mr. Hoskins, of Lincoln’s-inu, an eminent barrister and conveyancer. In this situation he remained about a year, when he took chambers in Gray’s-inn, and began to practise as a conveyancer on his own account. Independently, however, of his application to the laborious duties of his profession, he had, previous to this period, acquired great proficiency in general knowledge, and in particular a decided taste for old English literature, and an intimate acquaintance with old English authors. His reading, in this class, was most extensive, and only equalled by a memory uncommonly tenacious of facts and dates. 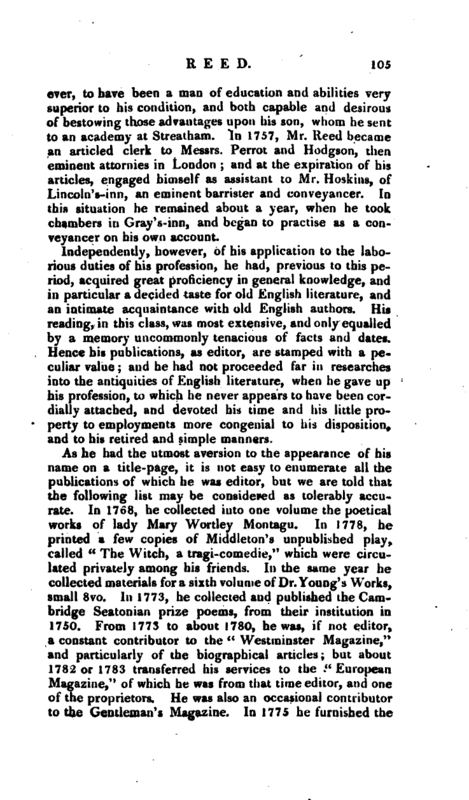 Hence his publications, as editor, are stamped with a peculiar value; and he had not proceeded far in researches into the antiquities of English literature, when he gave up his profession, to which he never appears to have been cordially attached, and devoted his time and his little property to employments more congenial to his disposition, and to his retired and simple manners. 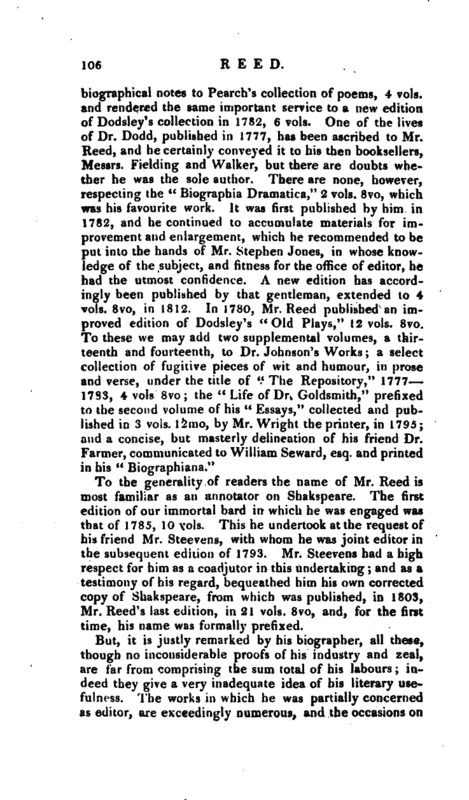 To the generality of readers the name of Mr. Reed is most familiar as an annotator on Shakspeare. The first edition of our immortal bard in which he was engaged was that of 1785, 10 vols. This he undertook at the request of his friend Mr. Steevens, with whom he was joint editor in the subsequent edition of 1793. 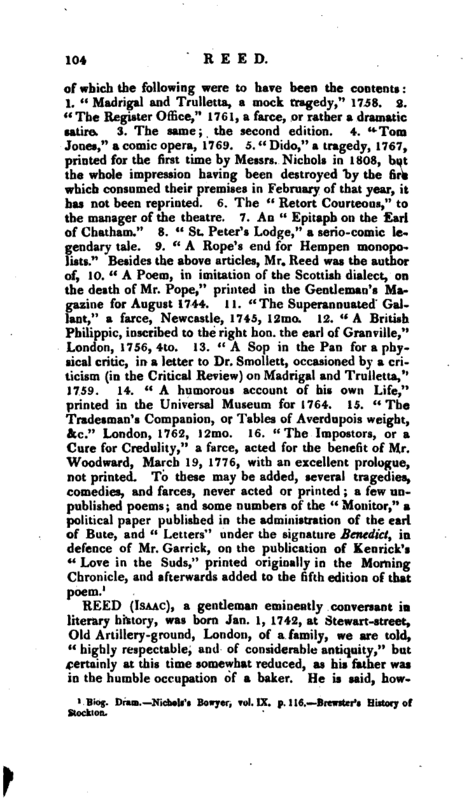 Mr. Steevens had a high respect for him as a coadjutor in this undertaking; and as a testimony of his regard, bequeathed him his own corrected copy of Shakspeare, from which was published,, in 1803, Mr. Reed’s last edition, in 21 vols. 8vo, and, for the first time, his name was formally prefixed. But, it is justly remarked by his biographer, all these, though no inconsiderable proofs of his industry and zeal, are far from comprising the sum total of his labours; indeed they give a very inadequate idea of his literary usefulness. The works in which he was partially concerned as editor, are exceedingly numerous, and the occasions on | which he has given his assistance in difficult points of literature, almost beyond calculation, particularly in what concerned the literary history of his own country. Although his manner had little of polish, he was always kindly ready to communicate the information he had for so many years accumulated; and perhaps received more public acknowledgments for his assistance in this way than any man of his time. 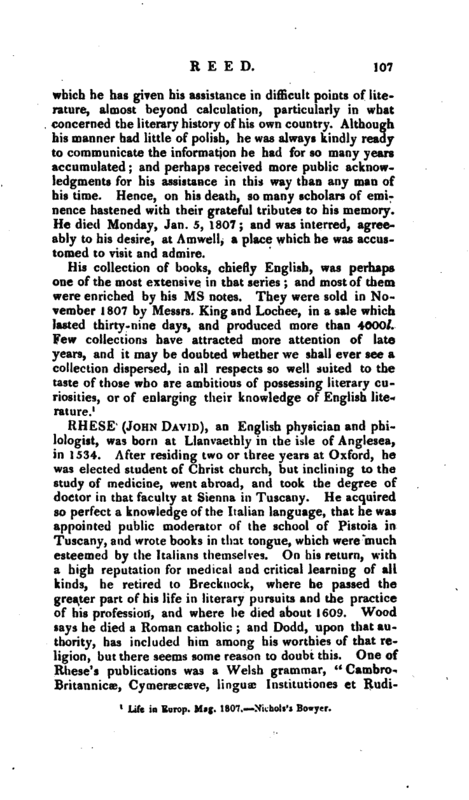 Hence, on his death, so many scholars of eminence hastened with their grateful tributes to his memory. He died Monday, Jan. 5, 1807; and was interred, agreeably to his desire, at Amwell, a place which he was accustomed to visit and admire. Life in Europ. Mag. 1807, Nichols’s Bowyer.